Figure 8.9. Scatter plot comparing Freelite and N Latex sFLC results. (A) κ sFLC. Six samples with markedly elevated N Latex FLC results are indicated (1 – 6). (B) λ sFLC. Four samples with markedly elevated Freelite results are indicated (7 – 10). Further dilution did not increase the N Latex FLC λ results. Dotted lines: normal reference intervals. (Reproduced by permission of SAGE Publications Ltd., London, Los Angeles, New Delhi, Singapore and Washington DC, from[©Pretorius, 2012]). Figure 8.10. Serum and urine electrophoresis. The clinical studies discussed above have provided a number of examples where patients known to have LCMM have had normal N Latex FLC results but abnormal results with Freelite assays. There are two reasons why FLC assays may fail to identify the presence of monoclonal sFLCs: 1) antigen excess (Section 8.4.4), or 2) complete non-reaction, in which the monoclonal antibodies fail to recognise a particular FLC clone. Pretorius et al. performed a comparison of Freelite and N Latex FLC results for 116 samples sent to the laboratory for routine FLC analysis (after exclusion of samples with Freelite <50 mg/L), and investigated any samples that were highly discordant. For 6/116 (5.2%) samples, N Latex FLC assays gave markedly higher κ results (Figure 8.9). When these six samples were further diluted and retested using Freelite assays, the results significantly increased, consistent with antigen excess in the Freelite assays. In contrast, 4/116 samples (3.4%) had markedly higher λ Freelite results (Figure 8.9B). Further dilution did not increase the N Latex FLC λ results for these samples. These four patients included one with confirmed λ LCMM for whom the κ/λ sFLC ratio was normal by N Latex FLC assays, but abnormal by Freelite (Table 8.8). It is noteworthy that the majority of diagnoses that were missed by the N Latex FLC assays were of λ type. Whilst the κ constant domain is typically encoded by a single C gene segment, the λ constant domain is encoded by one of a number of C gene segments (Section 3.3). It is probable that the monoclonal antibody-based assays fail to detect all polymorphic forms of FLCs, particularly λ FLCs that are more genetically diverse. Further evidence of the difficulties associated with raising monoclonal antibodies to recognise all λ light chain types was reported by Mollee et al. , and is discussed in Section 8.6.6. A patient with λ LCMM who was not diagnosed by the N Latex FLC assays is presented as a clinical case study below. In this example, serum immunofixation confirmed the presence of monoclonal FLCs that were detected by the Freelite sFLC assays, but not the monoclonal antibody-based N Latex FLC assays. A patient with λ LCMM identified by Freelite but not N Latex FLC assays . A 47-year-old woman was admitted to the Istituto Nazionale Tumori, Naples, with bone pain. An X-ray of her pelvis revealed osteolytic lesions, and a serum protein electrophoresis (SPE) was ordered but this revealed no obvious monoclonal protein. Subsequently, sFLC analysis was performed using both Freelite and N Latex FLC assays. Whilst the Freelite assay identified monoclonal λ sFLCs, the N Latex FLC assay results were normal (Table 8.9). 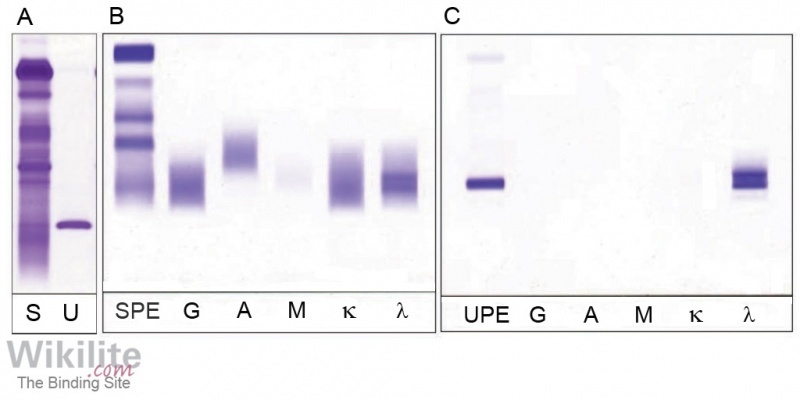 High-resolution agarose electrophoresis of serum and urine samples identified a monoclonal protein band Figure 8.10A), which was typed by immunofixation electrophoresis (IFE) as monoclonal λ FLCs (in the absence of intact immunoglobulins including IgD/IgE; Figures 8.10B and C). A bone-marrow biopsy confirmed the diagnosis of λ LCMM. The patient was admitted to the Hematology-Oncology Unit, and one month after the start of therapy, serum and urine IFE became negative and the Freelite sFLC assay values returned to normal. Table 8.8. Freelite and N Latex FLC patient results and reference intervals.